The first round of the presidential elections in Ukraine took place on March 31, 2019. 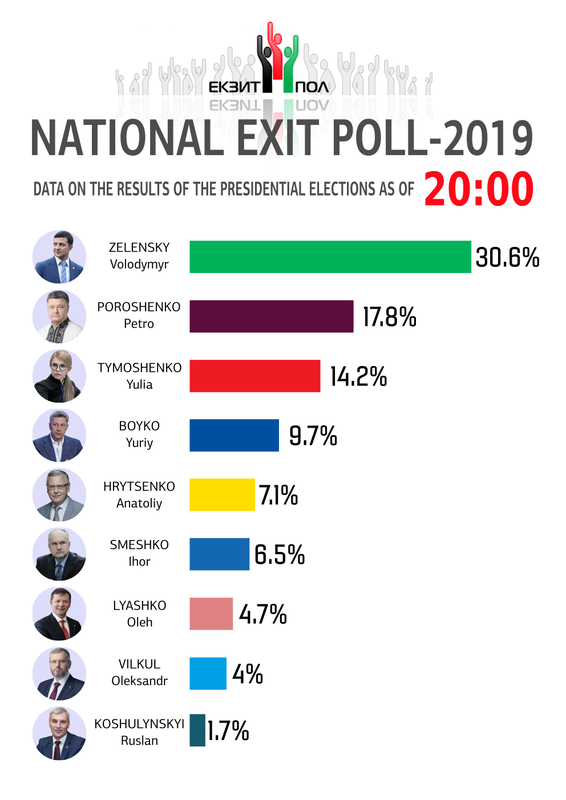 According to exit polls, Volodymyr Zelenskyi is the leader (with over 30 per cent of votes cast), Petro Poroshenko is in second place (with almost 17 per cent). Yulia Tymoshenko got 14 per cent and is thus not advancing to the second round. The official vote counting is still on. UCMC is following the updates and keeping you posted. The process of expression of political will was peacefull, transparent and democratic. 96 polling stations executed their functions good and very good. We documented a few of violations which were not systematic and have not influenced the results. The elections correspond international standarts and reflect the will of Ukrainian people. Ukrainian World Congress observers documented a few of violations during the first round of presidential elections. There are lack of information materials about candidates at the polling stations, delaying of polling stations opening, inappropriate facilitating and compilated access to the polling stations for seniors and citizens with disabilities. These violations have not influenced the result of elections. Ukrainian authority made efforts for appropriate conduction of presidential elections without usage of administrative resourse. This presidential elections correspond to international standarts of democratic elections. Ukrainian World Congress Mission confirms the facts of disinformation from the side of Russia as element of its hybrid war against Ukraine around the world. Russian media shows Ukraine as the territory of chaos, state that has gone out of the control and its split society. We have much more competitive, transparent and accountable elections that in 2014 and we really want to save the same tendency for the second round. But at the same time there was a “grey zone” of violations, for example the ignorance of legal limitations during the “silence day”. For the both leaders of the first round such compromises with the law were permanent. Right now the voting process stays calm and at the same time these small violations show that if you want to become a serious politician, even being a person “outside the system”, you need to not play according to the rules. And this is the very negative conclusion. Obviously, a complex set of reasons that we will call “anti-establishment” and which was the result of the failure of communication of the political class that includes both the ruling power and the opposition, as a whole, was at work. The idea that has been popular for many years is that the future is behind the “new faces”. Another thing is that the role of the leader of the “new faces” was tried by many to various degrees of success. Zelensky succeeded by combining a number of reasons: high recognition – he had no direct relation to public administration, but he did have a relation to political satire; identification of the character [in the series “Servant of the people”] with the actor who plays this role; the fact that traditional disadvantages, such as inexperience, were perceived positively. A very unconvincing attempt was to link Zelensky with the interests of Russia, as did the argument against oligarch Kolomoisky, which did not work, since for both Poroshenko and Tymoshenko are perceived to be as controversial as he is. The phenomenon of Zelensky can be explained by the protest vote against all politicians. Protest vote is not exclusive to Ukraine, but it is unique due to the fact that Zelensky has no political background or experience in the sphere of public opinion whatsoever. His main message is “I am different, I am honest” and we see that it worked in the first round. Regarding Poroshenko, his main accent is on what has been achieved, he stresses that he is the leader, who lead the country through difficult times and the war, on his role as a real Commander-in-chief and successes in foreign politics. My prediction is that these strategies would be the same for the second round: Poroshenko will stress that he provides stability, while Zelensky would adhere to broad positive slogans without going into details. One thing we can be sure of: the general line on Ukrainian foreign and security policy will not change. In case of Zelensky, though, the real question would be who his advisors in different will be, because he is inexperienced and his knowledge on politics is limited. “I analyze this [presence of certain narratives in mass media] from perspective of “battle of budgets”: which of the candidates has more funds to spend on media. All these videos, programs, shows – you need money to make it. And if we look at all this as a “battle of budgets”, the result that we saw yesterday was expectable. Concerning Russian narratives, the majority of them penetrate to Ukrainian media through promoted materials. The largest share of them are in local media – because promoted materials is their bread, they help them survive. And these small local media are among the main sources of information for 50-60 per cent of voters and influence their opinion. Ukrainian elections were covered by almost all mainstream Russian TV channels. – Ukrainians living in Russia, in Crimea and areas of Luhansk and Donetsk regions not controlled by Ukrainian government cannot vote. – “chaos in Ukraine”. It is actively promoted among international journalists and monitors, and the word “chaos” has often been used by international media writing about Ukrainian elections. However, as we can see, all international monitors now recognize that there was no systemic violations. The main sources distributing Russian narratives were Russian mainstream media and some TV channels in Ukraine. There are signs of polarization in the social media, and this is not good for the society. It is important for Ukrainians not to become “useful idiots” for those who can use it, to abstain from mutual offences and behave with respect to one another in political discussions. We had 50 long-term observers on site several weeks before the election, another 110 short-term observers. There was also close to half a million of Ukrainians participating in variety of ways and enabling their fellow citizens to become part of the political process. Based on the observations, discussions, exchanges – the elections were very fair, met international standards for democratic elections and should generate confidence in the voters. This first round was able to provide a very strong base of which future elections can be held. At the same time, there are concerns: legislation should be changed to make to it easier for the IDPs to exercise their right to vote; more opaqueness in campaign financing is required; there is an impact from the high concentration of media ownership and the fact that some candidates did not observe campaigning rules. There is also a very apparent ongoing effort by other parties to engage in the form of hybrid interference, even warfare by spreading disinformation, providing disruptions. It is welcome to note that Ukrainian authorities have done their best to take preventive action with the help of the variety of contributions and new technologies. “More than 2/3 of our subscribers – 71 per cent – viewed information about candidate Volodymyr Zelensky; 40 per cent – about Petro Poroshenko, 25 per cent – about Tymoshenko, 15 per cent – about Lyashko and Koshulynskyi. We have not registered cases when universities administration tried to influence the vote of their students. Students self-governance organizations, trade unions etc. were not involved into campaigning”. The number of polling stations abroad is insufficient. In a number of countries people had to wait in a queue for 3-4 hours. Another important challenge is distance. Some Ukrainian expats, especially in Canada and African countries, have to travel thousands of kilometers if they want to vote. The best solution would be to allow voting by mail, that would cost for the state as much as two envelopes and two postage stamps. It would be a good idea to provide online solutions for those who need to change temporarily the place of voting. “We analysed results of four exit polls and included the “parallel exit poll” conducted by the team of Yulia Tymoshenko. The results of these are similar, which confirms that the received data is reliable. “The most widespread violations were: absence of people in voters lists, especially those born in 1999-2000, non-admission of monitors to polling stations, lack of monitors’ certificates; inappropriate conduct of monitors, change of the heads of district and local election commissions, presence of deceased people in voters lists, giving money to voters. These cases were reported to the police and documented”. There were violations, but they were not systemic. According to the official data of the Ministry of Internal Affairs as of 1 AM April 1st, 196 criminal violations and 464 administrative violations were recorded during 3 month of election campaign. Among criminal violations, there were 22 cases of vote selling and 12 cases of vote buying were recorded in March. 2 cases of vote buying were recorded on the voting day, March 31. Other criminal violations included violation of secret voting, impeding the free voting, giving voting ballot to a person who had no right to receive it. The majority of these took place in rural areas. The most typical administrative violations were absence of necessary marks on the political advertisement materials and violation of pre-election silence. To compare, 127 criminal violations were recorded during presidential elections in 2014, the difference is not significant. As of the morning on April 1, 55,5 per cent of ballots were processed. Zelenskyi got 30,25 per cent of votes. Petro Poroshenko (16,54 per cent) and Yulia Tymoshenko (13,09 per cent) follow. Yuriy Boiko got 11,51 per cent of votes, Anatoliy Hrytsenko – 7,12 per cent. Petro Poroshenko got the majority of votes in Ternopil, Ivano-Frankivsk and Lviv regions. Yuriy Boiko is the candidate of primary choice in Donetsk and Luhansk regions. The first round of elections demonstrates several positive trends that concern the Ukrainian society. Vitaliy Sych, editor-in-chief of “Novoye Vremya” (New Times) Ukrainian media, emphasizes few points in his latest editorial. “I have just realized it today, how big and important is the way we’ve walked in the past 15 years. In 2004 Kuchma and Yanukovych made a try to highjack the presidential elections and blatantly falsify the results. They failed,” Sych wrote. “Since then, 15 years after, results of the presidential elections in Ukraine have become as unpredictable as in, say, France, three candidates had chances to win and five to advance to the second round. All candidates including those in opposition, can speak openly and sharply about each other on national TV channels. Media support different candidates”. “There are many investigative journalists in Ukraine and they can ‘punch’ the President in the most vulnerable places. They compete with each other. Results of their investigations become available to everyone in the country and no one questions their right to work. It was not like that in early 2000s. Polling organizations are also competing with each other and are releasing the data on the actual support to the candidates for president and to political parties. The same is valid for exit polls,” the editor proceeds. “We’ve walked quite a way in 15 years. Our former neighbors within the Soviet bloc – like Russia, Belarus or Kazakhstan, will still have to make a long and uneasy way,” emphasized Vitaliy Sych. Three different narratives crossed ways at the current elections.The voters whose main attention is with the war, were choosing the commander-in-chief (agreeing to his drawbacks in other spheres). Those whose main demand was the change of political elites, were choosing a new face (realizing his drawbacks or not realizing them). Those primarily concerned with poverty and alleged deteriorating welfare, were choosing the chief fighter against it. Despite the results of opinion polls showing that almost 70 per cent of Ukrainians consider the war the country’s main problem, on the voting day the desire to have a new leader was prevailing. Protest voting already in the first round. Voting results show that a large number of voters cast their votes against the political class and the actual establishment. Choosing between the risks of unknown and familiar faces they choose the risks (and the virtual possibility) of having a “new face”, even if it is obviously lacking experience, professionalism, independence and the vision where the country should be going. It is clear that Russia is closely following the elections in Ukraine as the country’s foreign policy will depend on the presidential figure. UCMC’s Hybrid Warfare Analytical Group has analyzed the key narratives that Russian media had on the day of the Ukrainian elections. Here are the main findings. All national TV channels in Russia were massively covering last days of the election campaign, pre-election silence day, the election process itself and the first voting results. Hosts of the top Russian TV show “60 minutes” Skabeyeva and Popov devoted the entire Sunday show to a thematic live broadcast. Elections in Ukraine are what the Kremlin-controlled media mainly focused on, what their agenda was. Minimum attention was paid to the local news, instead much effort was put into creating a negative image of other countries, a sense of chaos, danger and hostility to Russians outside of Russia. Further emphasizing the negative.The election process was portrayed as an event taking place amid high social tension for both the voters and the authorities. Russian media sought to reinforce the idea of the Ukrainian government as a “junta” that brought military vehicles to the streets. They presented reinforced security as armed pressure on voters. Promoting the idea of unfair elections that are not legitimate and presenting it as the position of Ukrainians. A huge emphasis is made on election fraud, while international observers say that the elections were fair. Russian media accuse Poroshenko of bribing the voters, sometimes they also accuse Tymoshenko. Presenting Boiko’s results being higher than actual.The manipulation allows the Russian media to a/ claim that the results were falsified, b/ contribute to the idea that the alleged pro-Russian electorate is being oppressed, c/ further promote the idea that Ukrainians desire their country’s foreign policy having a Russian vector but authoritarian government is suppressing their striving. Generally well-accepting a big share of votes cast for Zelenskyi, it goes quite in line with the destructive criticism towards the actual Ukrainian government that has long been on the daily media agenda in Russia. Temporarily stepping back on the idea to not recognize the election results earlier actively promoted by some Russian politicians and media. Vladimir Zhyrinovskyi has suggested a respective bill and it can be possibly implemented. Press secretary of Vladimir Putin, Dmitriy Peskov, said that until the elections come to a close, he will not be able to say if the results are to be recognized. It demonstrates that there is a scenario to not recognize them and the audience of Russian TV channels is well-prepared to it as it was earlier actively discussed. Whether the Kremlin applies it or not, depends on how discontent it is with the voting results.